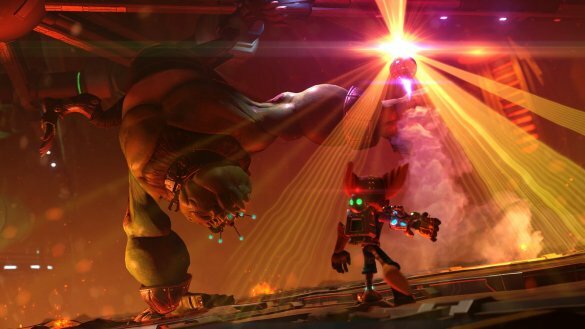 It seems odd, but it’s already been fifteen years since Ratchet & Clank first teamed up on the PS2. Now they’re all grown up and getting a movie released in theaters! Sure, it will get crushed by the new Captain America movie that comes out the next week, but it will be a moral victory for fans of the franchise nonetheless. To celebrate, Insomniac has gone back to the drawing board with the franchise. The movie is inspired by the series as a whole, and therefore includes a number of characters and scenarios that weren’t in the first game. To make a game that stays true to the movie and the franchise as a whole is no small task, but they were up for the job. This re-imagining of the the duo’s origin is a love letter to fans and a perfect entry point for newcomers. 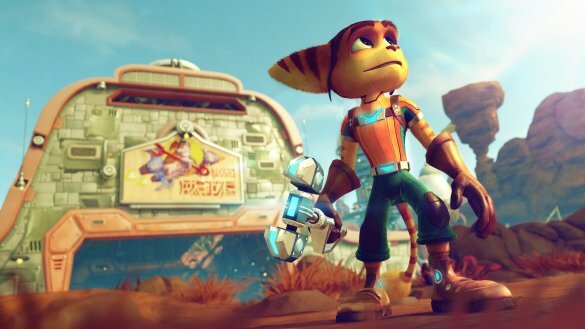 As the story goes, Ratchet is a furry mechanic with dreams of becoming a Galactic Ranger, an elite force made up of the heroes of the galaxy. As luck would have it, a defective warbot by the name of Clank clash lands on Ratchet’s planet with dire warnings of an impending invasion. The two team up to warn the Rangers, while also joining in the fight themselves. At the core, it’s a typical hero’s journey story. What sets this story apart, however, is the charm that oozes out of every character. The game never fails to deliver a humorous moment even in the most strenuous of circumstances. For example, the mayor of a town under siege continually tries to get the invaders to begin peace talks. Afraid his phone isn’t working properly, he checks for a dial tone and makes a practice call to his buddy. That’s just in the first half hour of the game, mind you. The story is told through the eyes of Captain Qwark. He starts the game in prison for undisclosed crimes, lamenting the upcoming release of a video game based off of the movie based off of the adventures of Ratchet & Clank. It doesn’t get more meta than that. His narration provides the game’s most humorous moments. If you don’t stop to laugh more than a few times, you’re likely dead inside. For fans of the original, this game definitely changes things up. There are old characters that didn’t make the cut, old characters in this game who weren’t in the first, and even a number of new characters from the movie. Even if a number of the game’s scenarios and locations end up being familiar, the story goes in a completely different direction. The game’s ending is rewarding in a completely different way from that of the original. However, a few things have been lost. 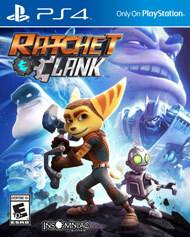 In particular, the dynamic between Ratchet and Clank doesn’t feel like it evolves or develops any real depth. The focus is put on Ratchet and Qwark. The story ends up being more than enjoyable despite this, but it almost feels like the game should have been named after that duo instead of the classic one. By now, you’ve seen how gorgeous the game is. It doesn’t wow on a technical level compared to the true giants of the current generation, but the bright art style and fantastic attention to detail make each world feel unique and alive. The game looks great when you’re standing still, but looks even better in action. Between firing your various guns, enemies attacking, enemies dying, bolts flying, and all of the background effects, the screen is a flurry of visual splendor. Even better, the frame rate holds up spectacularly throughout, allowing you to enjoy the chaos without negatively affecting your ability to play. 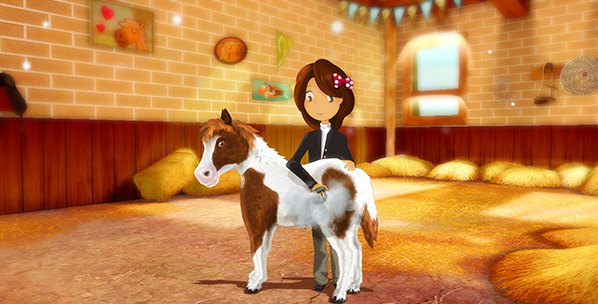 The animations are also generally top notch. Ratchet in particular looks fantastic, with great attention to his fur ruffling as he moves, or his expression and he soaks in each new planet. Quite frankly, this is the best the franchise has ever looked, and it is certainly one of the best looking games this year. At the absolute least, it’s the best looking budget title out there. For the principal cast, the classic voice actors return and do their usual bang up job. Jim Ward as Qwark is just too perfect. However, a number of the celebrity voice actors from the movie turn up to voice their counterparts. It’s done fairly well compared to normal, and I have no complaints. During gameplay, the effects are utterly fantastic. The classic sound effect of bolts being collected is back, and the boom of the various guns is perfect as ever. 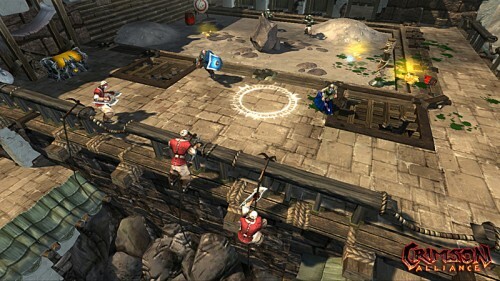 Musically, the game uses a more orchestral track that is suitably adventurous if a little off putting when compared the the franchise’s more electronic past. Still, it’s solid music, even if it is often overshadowed by the cacophony of combat. Also, Mr. Zurkon is back and as good as ever. Top marks all around! Ratchet & Clank is a third person action adventure game with focus on gun based combat and platforming. You have a large variety of both typical and more wacky weapons. For example, you have a pistol, a sniper rifle, a grenade, and a rocket launcher. You also have a disco ball that forces all enemies in the area to break down and boogie. Sometimes typical and wacky combine as well. The new weapon for the game is the Pixelizer. 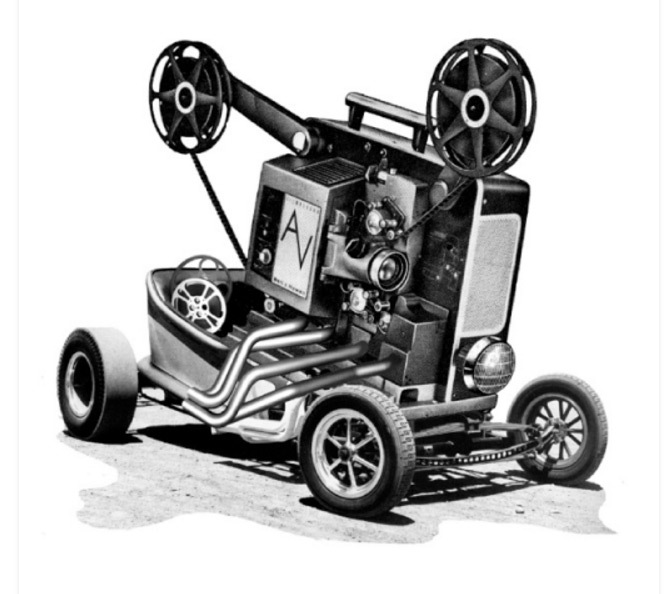 It functions like a shotgun for the most part, but it also turns anything it hits into a 2D jumble of pixels. It’s wonderful. The game controls better than any game in the series. You move with the left stick, control the camera with the right, fire with the shoulder buttons, and change weapons with triangle. You can strafe by simply moving from side to side, but you can also lock strafe to make sure you stay on target. The tight controls and proper camera control make the 3D platforming pretty much spot on. It’s easy to tell where you going to land when you jump, and you’ll rarely have an issue getting there. Each of the game’s locations is usually broken down to two or three paths you can take. One of these paths typically moves the story forward, while the other(s) net you a new gadget or open up another planet for explanation. For the most part, you won’t have to revisit previous planets unless you want to suss out secrets you missed. This is a change from the norm. 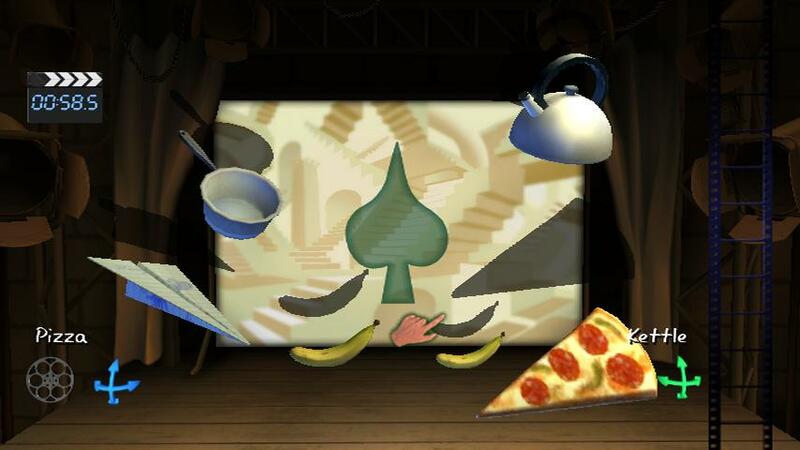 In the original game, you bounced back and forth as you unlocked gadgets. It helps that you start the game with the Swingshot this time around Once you set off on a path, it’s pretty straight forward. Enemies will appear only ahead of you, and moving forward will eventually get you back to the central part of the level. Sometimes it loops, and sometimes you get a warp pad or a taxi cab to send you back. In this way, it feels like each planet is a small number of linear levels instead of a fully realized world. That’s OK, but it does break the illusion a bit. Progression in the game isn’t simply about getting from Point A and Point B, however. Everything you do moves you forward in some way. 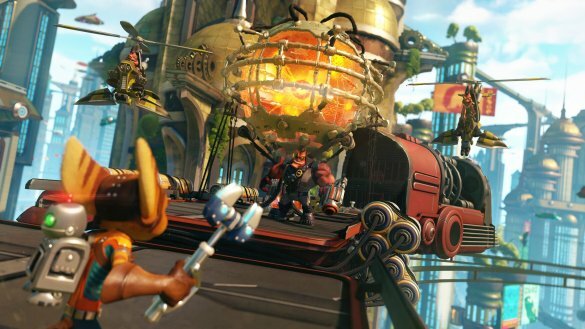 Defeating enemies and smashing crates gives you bolts which can be used to buy new weapons, using weapons earns them experience and levels them up, defeating enemies levels Ratchet up and increases his maximum health points, etc. A couple of the more unique features are raritanium and cards. Raritanium is a rare resource found in levels and dropped by enemies. This can be spent to upgrade your weapons by adding modifiers. This is done in a grid like system at the shop. As you level the weapon up, more upgrades will become available. There are some special upgrades that are unlocked when each upgrade around them is unlocked. This typically unlocks are more powerful boost such as making the aforementioned disco ball exploded when it finishes instead of merely dissipating. 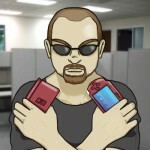 As for cards, they too are dropped by enemies and found throughout levels. The cards feature an image from the series, as well as some trivia and/or a biography. There are sets of three cards that, when collected, reward the player in one of two ways. Character and location sets offer passive boosts to you drop rates, while weapon sets unlock more powerful versions of that weapon for purchase in challenge mode. Best of all, you can trade in duplicates to get a card you’re missing, meaning this feature isn’t quite the crap shoot it first appears. To break the action up, there are puzzle sections in the game as well. In these, you’ll control Clank and use him to manipulate little robots into opening doors for you. These puzzles are typically multi-step affairs that will require you to think out of the box. You can take a little robot and turn him into one of three different types on the fly. Trampoline bots give you a boost, bridge bots let you cross gaps, and generator bots power up objects. These aren’t that difficulty, but offer a refreshing change of pace. Playing through the game will take eight to ten hours your first time through. After that, you can feel free to run back and find all of the gold bolts and cards you missed. Gold bolts unlock various cheats. There are visual effects such as changing Ratchet’s head to that of a T-Rex. There are also mods that speed up and/or slow down the game. It gives you something to play with when you’re done. You can also start a challenge mode playthrough. This ups the difficulty of the game while letting you keep your gear and upgrade it further. This is highly recommendable, as going through early sections with late game weapons is all kinds of fun. However, the story and layout remains the same, so it won’t appeal to everyone. 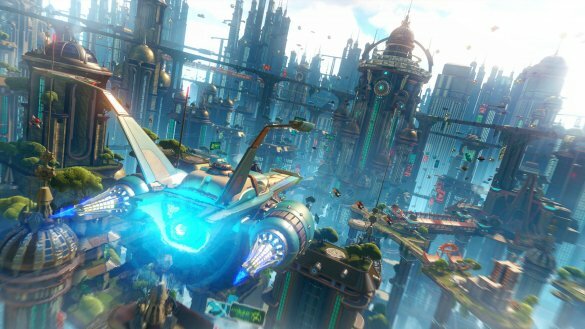 Ratchet & Clank is a darn fun game. It has the personality to make up for a weak narrative, the presentation to make it stand out, and a fun gameplay system that rewards the player for pushing forward. It’s a perfect snapshot of what the series represents, and it’s done to perfection on the PS4 for the firs time. Some old fans might lament some of the changes or lack of innovation, but the game is too well polished to dislike. 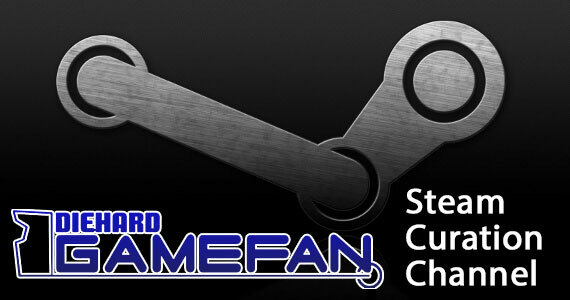 It also represents the perfect entry point for new fans who don’t have access to the original games. Chalk this up as yet another hit for one of the most consistently good franchises in video game history. 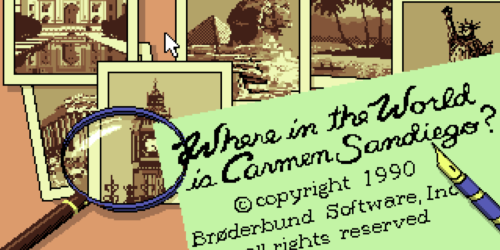 Diehard GameFAN Hall of Fame Nomination: Where in the World is Carmen Sandiego?